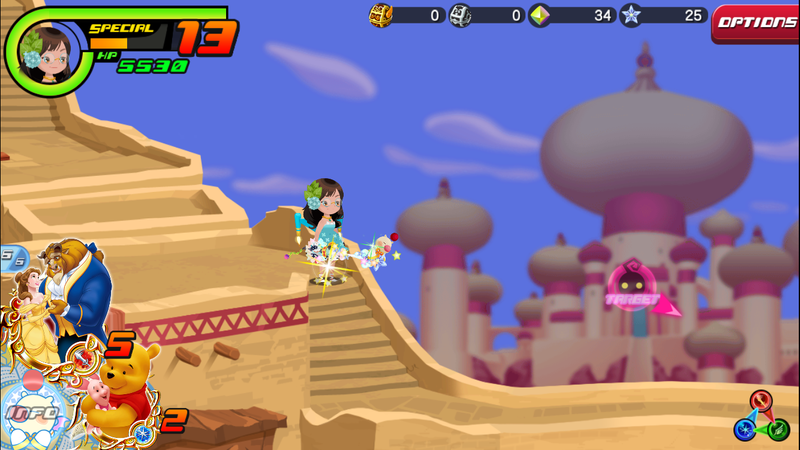 Today’s article is inspired by “A Day in Agrabah”, which originally played in Kingdom Hearts I, and is also in Kingdom Hearts Union Cross as the music for all of the Agrabah quests. There are lots of cool things about this track, from the instruments that are used to the interesting tonality (which we will talk about tomorrow! ), and the rhythms. This article is going to focus on the rhythms, and more specifically, on triplets. And since we’re talking about triplets, we’re also going to talk about duplets, because the two pretty much go hand-in-hand. There are so many great things about this track, as I previously mentioned. But let’s focus in on the topic for today: triplets. There is one part in particular that incorporates two types of triplets, the first being from 00:03 – 00:06, then 00:11 – 00:14, and many more times throughout the piece. So what exactly is a triplet? A triplet is defined as three notes in the space of two. That is, three quarter notes where there are usually only two quarter notes, or three eighth notes where there are usually only two eighth notes, etc. “A Day in Agrabah” actually uses both quarter-note triplets and eighth-note triplets. In the very first measure, we have a half rest (two beats of silence), a grace note (which doesn’t carry any rhythmic value, since it is played so quickly), and a half note (two beats). Then in the second measure, we have a quarter rest (one beat), three eighth-note triplets (which adds up to one beat, since two eighth notes add up to one beat), then we have three quarter-note triplets (which add up to two beats, since two quarter notes add up to two beats). The third measure has four eighth notes (two beats), three eighth-note triplets (one beat), and one eighth note beamed together with two sixteenth notes (one beat). Triplets add some nice rhythmic variety to a piece, which is especially highlighted when the rhythms are being played by a single pitch, as they are here. The instrument playing the melody we just heard could easily have played and sustained that one pitch, holding out over a few beats until the end. But by having it play a much more interesting rhythm, it gives the entire piece a bit more flavor and interest. So what are duplets? Well, they’re exactly the opposite of triplets. In simple time, where each beat is divided in two, you can put a triplet to have three notes in the space of two. But for compound time, where each beat is divided in three, you can put a duplet to have two notes in the space of three. There are not nearly as many examples of duplets in popular music these days, but they are arguably just as important. “Now what does a triplet sound like against a duplet?”, you ask?? Great question! This is an exercise that I like to do with my students—they at first think it will be difficult to do, if not impossible, but after I tell them one phrase, then they all get it! Let’s look at and listen to what three against two sounds like. That is, an eighth-note triplet going at the same time as two regular eighth notes, but with the emphasis on the triplet (the lower notes). When you put the emphasis on the three notes against two, it can help to think of the phrase “nice cup of tea“. Try it out! Tap three with your dominant hand, and two with your other hand. “Nice” is when both rhythms hit at the same time (both hands), “cup” is the second triplet (dominant hand), “of” is the second regular eighth note (other hand), and “tea” is the third triplet (dominant hand). Now let’s look at and listen to what two against three sounds like. That is, an eighth-note duplet going at the same time as three regular eighth notes, but with the emphasis on the duplet (the lower notes). When you put the emphasis on the two notes against three, this time think of the phrase “pass the butter“. Again try tapping two with your dominant hand, and three with your other hand. “Pass” will be when rhythms hit at the same time (both hands), “the” is the second regular eighth note (other hand), “but-” is the second duplet (dominant hand), and “-ter” is the third regular eighth note (other hand).